My daughter is the one in the white gown (she wore my wedding gown). Her friend since 6th grade is the other bride. 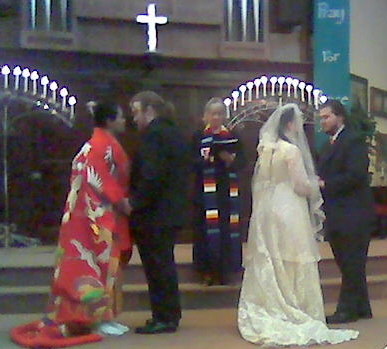 This was not a Catholic ceremony for a number of reasons, but it was a church wedding. The lady minister is the one in the multicolored stole. Thank you for posting this picture. Tell more about the special day. She wore your wedding dress? That's so awesome! Many Years to the newlyweds! They look fabulous! Your dress is lovely Alicia! How special to get married with your best friend too. This page contains a single entry by alicia published on October 28, 2007 9:45 AM. wikipedia spoof for real was the previous entry in this blog. new blog alerrt is the next entry in this blog.